You can find Episode 22 on PodBean, iTunes, or Stitcher! In this episode we explore a field of paleontology that studies a unique category of life – the very, very small kind. Here we look at the tiniest things to fossilize as we talk about Micropaleontology. As the name suggests, micropaleontology is the study of microfossils, which are generally any fossils that require a microscope to view. Typically this includes fossils smaller than 1-2 mm in size. In this definition, anything larger than a couple tenths of a centimeter is a macrofossil. This classification is one of size and not taxonomy, so micropaleontology covers the study of a wide range of organisms. The fossils studied can come from every kingdom of eukaryota (animal, fungi, plant, and protist) and beyond. Microfossils have taught us much about earth’s history. They are integral in subjects such as paleoecology, climatology, modern conservation efforts, and are of major importance in drilling projects. But the most significant thing microfossils have aided paleontology with is biostratigraphy. The abundance, fast evolutionary rate, and long history of many of the species studied allows for a very consistent timeline to be created. By far the most famous of microfossils are the foraminifera. These protists are mostly marine amoeboid cells that are encased by tough shells known as tests. Fossils of these tests are very common and are the main component in many deposits of limestone. The composition of the tests can tell us a lot about the environments they occupied at the time. To read a more thorough introduction to this group check out the Letters from Gondwana blog post. Some examples of foraminifera tests. Image by Jeffdelonge from Wikimedia. 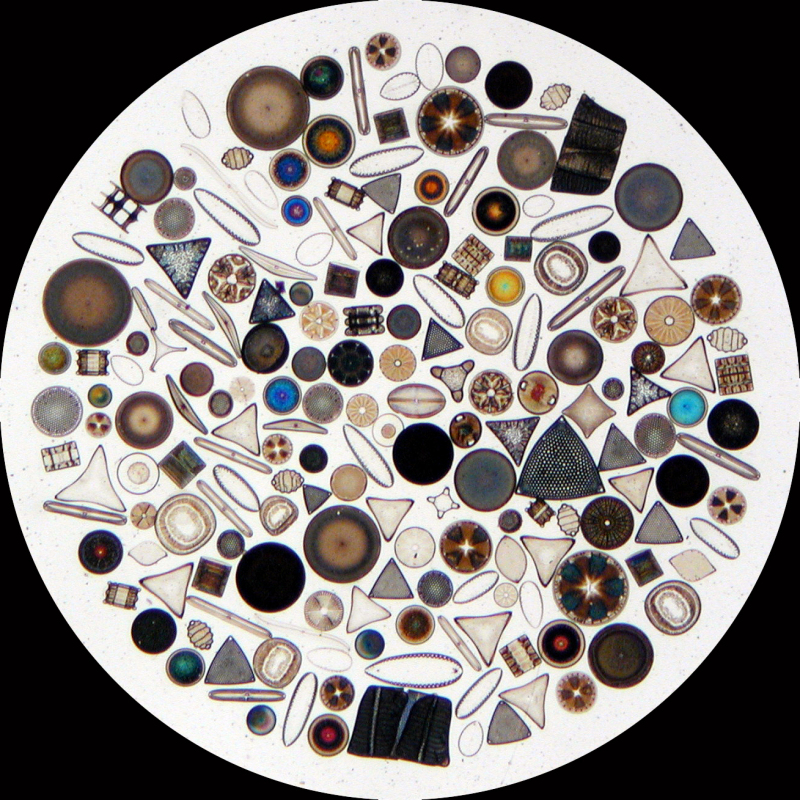 Diatoms are one of the most common types phytoplankton, today and in the past. Image by Wipeter from Wikimedia. These small, filter feeding zooplankton leave behind silica skeletons very similar to those of diatoms. Image by GrahamBould from Wikimedia. Scolecodonts are the fossilized mouth-parts of polychaete annelid worms. Image by Olle Hints, modified from Wikimedia. Conodonts are eel like vertebrates that are now extinct. Their complex teeth are typically all that remain of them. Image by USGS from Wikimedia. One of the few microfossils were an entire animal is preserved. These flat crustaceans persist today in both marine and freshwater environments. Image by Anna33 from Wikimedia. Microfossils provide a wealth of information about the past, but working with specimens at such a small scale is challenging. Micropaleontologists employ a variety of unique techniques – physical and chemical – to find, identify, and separate out microfossils from their sediment. For more examples of microfossils and links to learn about them please explore the website for the Society of Micropaleontology. This organization focuses on promoting the studied and education of all variety of microfossils.